SYNOPSIS: What happens after the oh-so-brave prince slays the dragon, swash-buckles his way into the castle, saves the damsel-in-distress and lives happily ever after? Prince Charming gets kidnapped! With the kingdom in panic, the dimwitted Squire Squdge is determined to find Prince Charming to prove his knightliness to the kingdom. With the help of Lulu, the unhygienic and less-than-ladylike town wench, the ever eager duo team up to interrogate the notorious villains of the kingdom: Nork the Ogre, Rumpel, the Wicked Witch and her two daughters. But even after the interrogations, Squdge and Lulu are no closer to finding Mr. Charming. After the unlikely (and very lucky) discovery of Prince Charming, the ultimate fight breaks out between our not-so-classic heroes and our timeless villains. Featuring an angry mob in search of a witch and an on-going bet between our Storyteller, the story’s Fiend, and Rumpel, only the cast of After Happily Ever After can make this new take so dazzling! 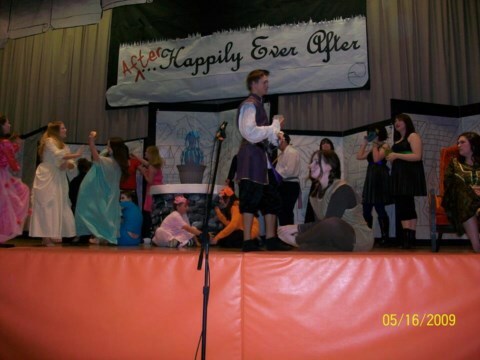 Photo of the original play cast at TCCS.